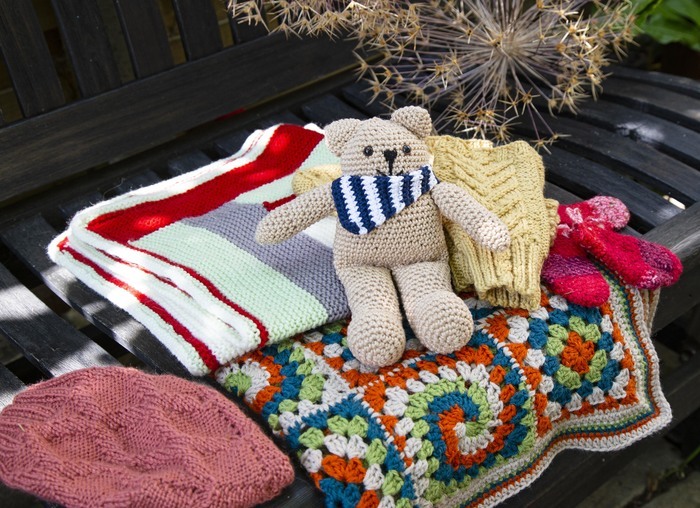 It is Commit to Knit month and you may well be trying to decide what you are going to knit for charity and how best to choose an item or a cause. So here are a few tips to help you. It can be difficult to know whether it is better to make something to donate or items that can be sold to raise money. With this in mind we have a list of charities on our website that welcome donations or have suggestions on how you can knit or crochet to help them. But it is also worth contacting local charities to see if they have any specific projects you could contribute to. How much time do you have? It is better to make a couple of small items and actually donate them than commit to a large project that you may not be able to complete. You can also take a look at our collection of charity patterns for this year – we have some suggestions on how they can be used here. Part of Commit to Knit month is about doing something for a cause that means something to you. So the best choice is making an item for a charity you have a connection with – this often has the best results. A great example of this is Claire Young who started knitting again when her husband died three years ago. She started making items to raise money for the hospice he had stayed in and this escalated to her creating the Work of Heart garden for the RHS Malvern Spring Festival to raise even more for it. Thousands of people have contributed to her efforts which have so far raised £25,000 for Sue Ryder Leckhampton Court hospice in Cheltenham in what for Claire has been a life changing experience. Hopefully she will inspire more of you to exciting woolly charity feats. I am knitting “twiddle muffs” – plus an extra one without twiddles for a neighbour who has ”Reynaud’s Disease” and asked if he could have one to keep his hands warm.